Art therapy is a form of treatment that uses art to help people work out their feelings, and a tool that can help experts diagnose their patients. Children and many adults may find art therapy easier than other types of therapy, because they may not have to use too many words to get relief. Instead, in art therapy, it is often the art and its symbolism that tell the therapist how that person is feeling inside. This is important for patients who find it hard to talk about their feelings or for the young child who may not have the words to describe a traumatic or painful experience. Besides helping patients express their feelings, art therapy can help patients cope with difficult situations. The act of making things, creating art, is relaxing and reduces stress. Painting on a canvas or squeezing a piece of clay feels good. It’s also a great feeling to watch an art project take shape, something you make with your own hands. Whether a painting, drawing, or other type of art, an art object can become a symbol of the child’s experience. Having that symbol helps the child to put distance between himself and his medical or emotional issues. A sick child might, for example, draw a picture of a painful or frightening treatment. In the case of a child who was abused, he might draw a picture of the abuse. Once the child sets it down on paper (or in clay, or some other art medium) he has acknowledged what has happened, made it real, and now he can move on to be the person he is, outside of the painful treatments or abuse. Children would rather do something with their hands than talk about their feelings. They may worry that adults won’t believe their stories and sometimes that happens. It is painful for children when they are telling the truth and no one believes them. Art gives children a powerful tool for saying how they feel. The child looks at the artwork she has made and she feels good. She created it, and to her, it’s very real. Her artwork gives form to what she feels and thinks. It’s something she can point to that expresses her feelings with credibility. It’s all there, without any need for words. Art is believable. Then again, the child with cancer, or the victim of abuse, may want to use art not to express these unpleasant feelings. The child with cancer may want to remember that she is also the child who adores the color purple, loves flowers, and has a silly sense of humor. That too, can be in a child’s painting. Through art therapy, children can come to understand that they are people beyond and outside of their illnesses or experiences. Sometimes it is difficult to know what is bothering a troubled child. A trained art therapist may be able to diagnose the problem by examining a child’s art. Dr. Carole Lieberman is one such expert. A Beverly Hills psychiatrist and bestselling author who treats children and their families, Lieberman has experience in interpreting children’s drawings. Dr. Lieberman also acknowledges that a parent or teacher may be able to tell something is bothering a child, just by looking at that child’s painting or drawing. A child may be putting out distress signals through art and parents should be watchful. “Parents should worry if their child’s drawings are mostly in dark colors, since this is a typical sign of depression. A child’s world seems very dark when they’re depressed, so that’s what they draw. “If a child draws something and then scribbles over it in long dark strokes, it means that they are very angry. And if you can still see what they were covering over on the page, you will have a clue as to what they are angry about. “If a child draws a dilapidated house, with no flowers or trees around it, and no sun, it means that they see their own house as being unhappy. “If they don’t draw windows, it can mean that they don’t want people to know what goes on in their house, or they think they are not supposed to tell what goes on there,” says Dr. Lieberman, who cautions that parents should consult with an art therapist before jumping to conclusions about a child’s art and what it means. To sum up, art therapy offers a stress-reducing, tangible, and nonverbal way to explore and deal with feelings and issues. If your child hates to talk about her feelings, art therapy may be just the ticket. The American Art Therapy Association (AATA) website links to a directory for licensed art therapists in the United States, broken down by location. 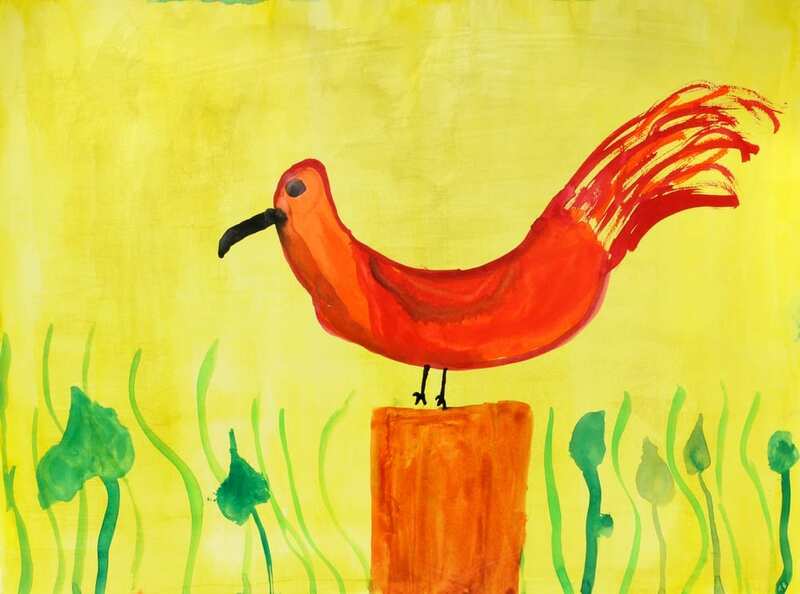 Has your child used art therapy to cope with chronic illness or a difficult experience? We’d like to know about it. Write to Varda at Kars4Kids dot org with your child’s success story. Parker Loves Life, you can see it right here in this screenshot. It came up in one of the Google+ neuroscience groups I follow. Heather Ward was putting out a distress signal: her daughter’s friend Parker Monhollon had just been diagnosed with an inoperable pediatric brain stem tumor. I deleted the notification without reading through to the end. I really did not want to read about this, did not want to allow my heart to get involved with yet another pediatric cancer victim who was in all likelihood, doomed. Despite my reluctance, my inner voice screaming, “NO. Not again,” I found myself using gmail’s undo function to restore the notification, to take a closer look. It was too sad and too difficult to watch a 6 year-old child die. Could I deal with reading about Parker, getting emotionally involved in HER story, her illness, a family’s grief? Yes, I chastised myself. You most certainly can. It’s the least you can do. Where is your humanity? And so I clicked through to Parker’s Facebook page, Parker Loves Life, and started reading the posts, about all the people who were doing whatever they could to give Parker and her family, hope, support, and love. Pushing their faces into whipped cream pies, wearing purple, selling slushies, anything to offer their support. And because I was hooked. Parker had stolen my heart, just as all the people doing things to raise awareness of her plight had had their hearts stolen by this little girl, Parker, the girl who loves life itself. And it’s the most heartbreaking thing in the world to know that she is so gravely ill and that no one really knows how to heal her. So I liked and followed her page and despite the fact that my life is overrun with emails and notifications, I chose to receive notifications of all posts. Does it do Parker any good at all that I randomly follow posts on her page and eagerly watch for updates on her condition? I believe it does. For no logical reason at all. I believe that caring for others and spreading the word about others’ difficulties can move the heavens in our/their favor. And for this reason, I am rooting for Parker Monhollan, a sassy 8 year-old from Silver Lake, Kansas, who was diagnosed January 15, 2016, with DIPG (Diffuse Intrinsic Pontine Glioma), a spider of a tumor that has woven its many-stranded tendrils in a tangled web over and around this little girl’s brainstem, threatening her very life. In my mind’s eye, I am hugging Parker and her parents, who are going through something unspeakable—something a lot worse than too much email. And I’m letting them in to occupy my heart and soul. Even if it makes me cry. Won’t you do so, too? It was Thursday evening when I heard the sirens and knew without a doubt that terror had once more struck my community. There’s something about the way sound carries from the highway to my home and I hear every ambulance, every fire truck and police car. And I know that when I hear several of them in succession, several sirens, this means there’s been something out of the ordinary, and it’s either a very bad accident, or a terror attack. It being Thursday, I just knew it was the latter. For several weeks in a row, there have been terror attacks on Thursday evenings in the same general area, the Gush Etzion Junction. There’s a gas station there, the only one for miles around, and there’s a large discount shopping center there, too. Those not privileged to own cars can also catch a bus from there, or hitch a ride home or to town. It is here that three boys were kidnapped and murdered last year in an attack that made it into mainstream international media. And there have been many more attacks before and since. The terror waxes and wanes and right now it’s waxing. I was brushing beaten egg onto risen loaves of challoh bread when I heard the sirens. I’d signed out of work for the day and was getting my Sabbath baking done, as I always do on Thursdays. 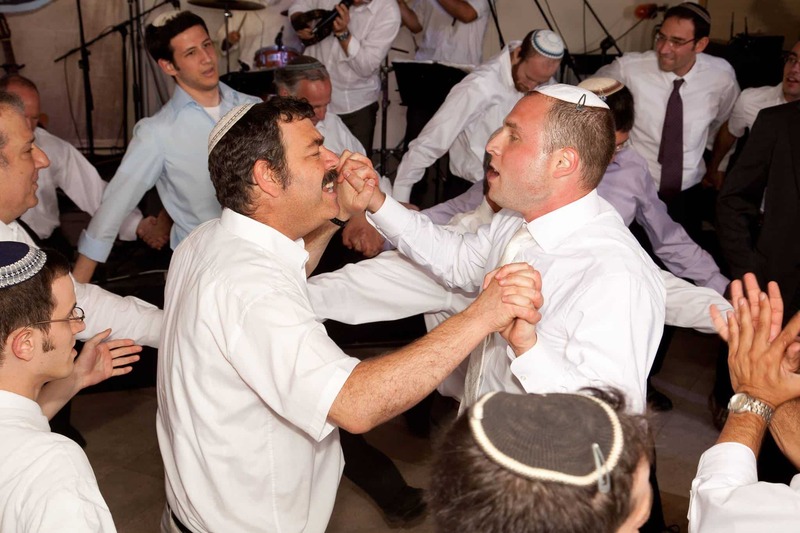 Thursday is that day in the week where I live: the day that people shop and bake and cook for Shabbat, the Jewish Sabbath that comes every week at sundown Friday night. The oven was preheating, my kids were doing their homework in the living room, and I was in the kitchen, being Earth Mama. It would have been cozy, had been cozy, until I heard the sirens. That is when terrorists strike. 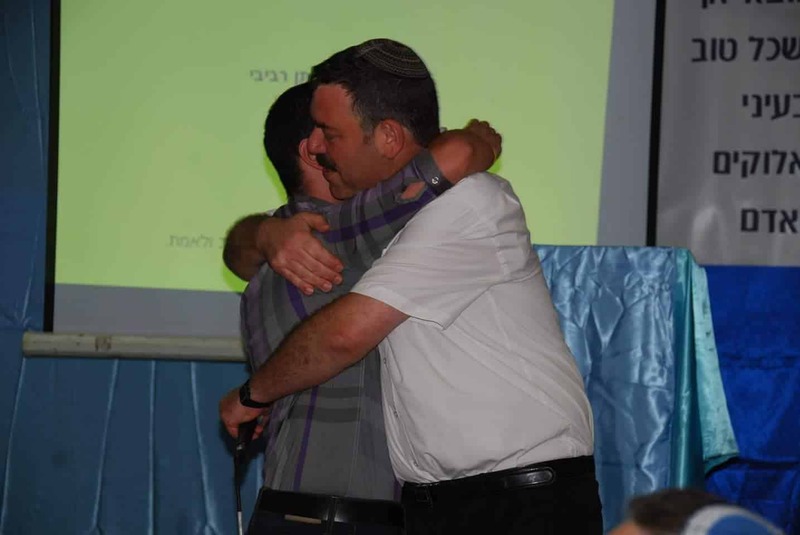 They strike on Thursday nights, when the junction is jammed with people shopping at the Rami Levy Supermarket, and trying to get home after the long work week, to get home to their families. Where I live, Thursday is the equivalent of TGIF. Friday is a day off. But Thursday is that last day of the week where all are hustling to get their acts together before Shabbat. I sprinkled poppy seeds over my loaves of bread and slid them into the oven. While the challoh was baking, I sat down in the living room to check my mail. 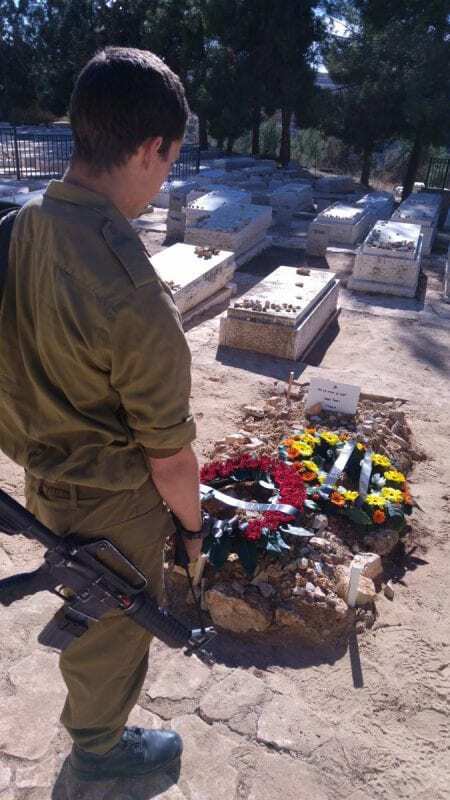 Asher, my 15 year-old son, was sitting at the PC and Yitzchak was sitting on the couch, looking at his phone screen. The mustache as big as his smile. “What? ?” asked Asher, jarred enough to tear his eyes away from the game he was playing. “BDE” is the acronym for the Hebrew phrase that means “Blessed be the True Judge.” It’s what Jews say when someone dies. It’s an affirmation of faith during the worst that can befall a person: death. “Baruch Dayan Emess,” I said, “Blessed be the True Judge,” affirming faith in a room filled with the scent of baking bread. A cozy room where nothing bad ever happens. Where children are always safe. Hugging a student at graduation. No wonder he was killed, I thought. This sort of thing never happens to regular people. Only to the really special people. Like the one teacher everyone loved. 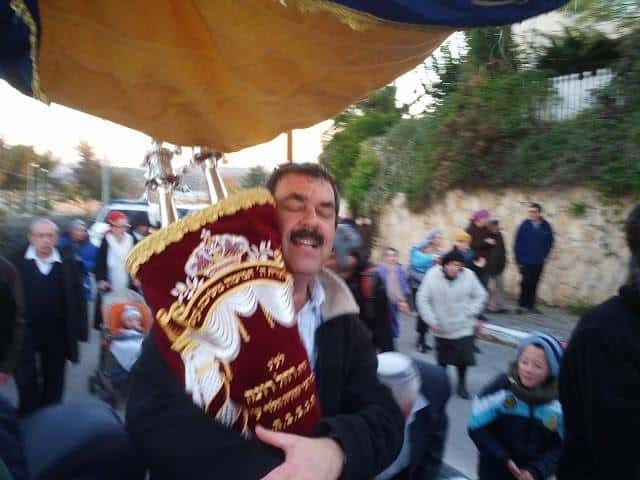 At a celebration, dancing with a Torah scroll. There was a stunned virtual silence as all the keyboards of all the members of my very large family fell into disuse, 13 keyboards awaiting fingers that were too shocked to move above the keys. Everyone knew this man, Rav Yaakov Don. He was a beloved and charismatic personality in our local high school. He had taught Yitzchak, Asher, Natan, and my 18 year-old son Moshe, too. The oven timer beeped. I pulled a challoh out of the oven, and rapped on its bottom to hear that hollow sound that says, “I’m done.” I thought about Rav Yaakov Don’s wife missing her husband on Shabbat, his children, missing their father, having no one to preside over their Shabbat table. I set my challohs on racks to cool and asked my children to tell me stories about Yaakov Don. I thought it might help them process the shock, the first real loss they’d ever experienced, but not a normal loss. They’d been robbed by terror. Someone who represented all that is good and true had been erased by evil. Evil had been the victor. Good had lost. And how could anyone be so evil as to kill this particular man, who was so fine, so beloved a teacher? It could not be understood with the logical mind, nor with the heart. The kids were yearning for some relief from this terrible truth. It was too much. So they did as I asked, hoping that reciting a story or two would erase the terrible discomfort of a beloved teacher, murdered. Asher tried. He said, “Once, he challenged us to see what was the longest time we could sit without making noise. He had us sit in a circle. He sat on the floor with us. He looked around at us, we all looked at each other and at him. We were so quiet. We always wanted to do whatever he asked. 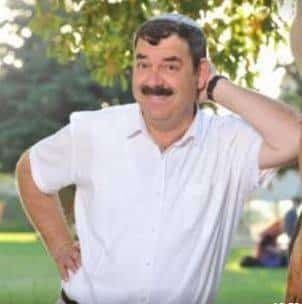 “He was always smiling, always laughing,” said Yitzchak. We all fell silent, thinking that never again would they see his smile, hear his laugh. The school called for an assembly to be held at 9:30 PM. 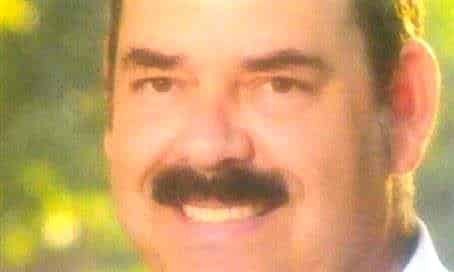 The boys would go and talk about their teacher, remember him. But it was only 8 PM, now. Yitzchak asked if they could break into one of the challohs. Sometimes I let them. They love to eat the fresh baked bread with butter and honey. None of us had the heart to prepare supper. 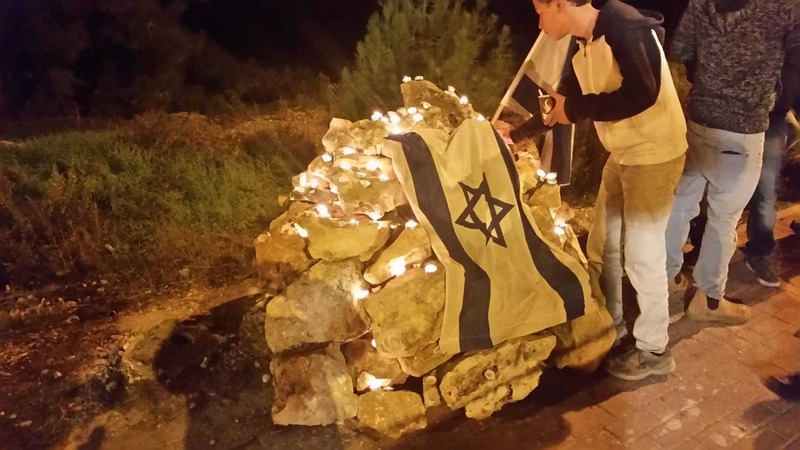 A student leaves a candle at the site of the murder of Rav Yaakov Don. And so we sat in a cozy room and broke bread together, the salt of our tears melting into the warm bread, cutting the sweetness of the honey, mixing with the butter. The boys told tales of their beloved teacher. The one teacher who had loved them no matter how they dressed or behaved, no matter what they said. His huge mustache and heart had been known to all. He had been a presence at the school and in the community. 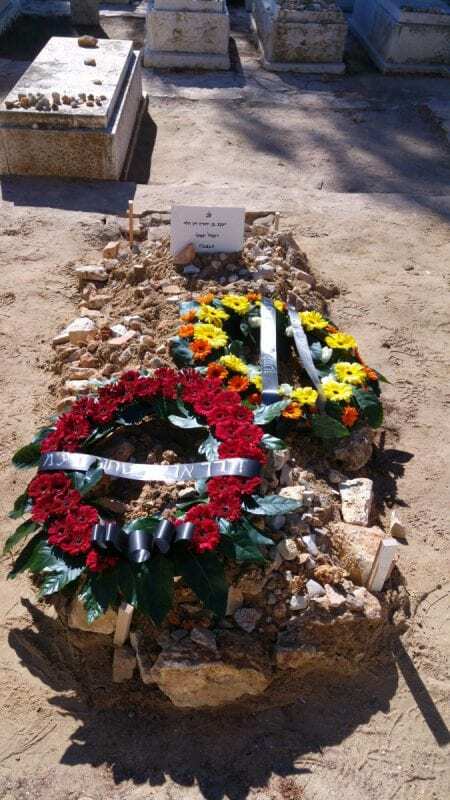 Rav Yaakov Don, 49. Beloved husband, father, teacher. Absolutely irreplaceable. Drama therapy is a form of treatment that uses playacting to explore feelings in a safe environment. In drama therapy, participants may use storytelling, improvisation, and performance to solve problems, vent feelings, or work toward emotional goals. Drama therapy can succeed where other forms of therapy fail, because first of all, it’s fun. Second of all, drama therapy helps participants experiment with different behaviors and responses to events without any risk, because it’s all play, with none of it real. Another reason drama therapy works so well is that it touches more of the senses than simply sitting and talking with a therapist: it’s multisensory. Getting up and acting something out makes it more real, than talking about what you did and what you might have done instead. In drama therapy, too, the goals are modest. You’re not looking for some incredible breakthrough. You just want the party to get comfortable with his or her feelings. Drama therapy is a great way for kids to work out how they feel about things, or to vent feelings they’ve been too afraid to share. Kids already use drama therapy every day, without being aware that they do so. 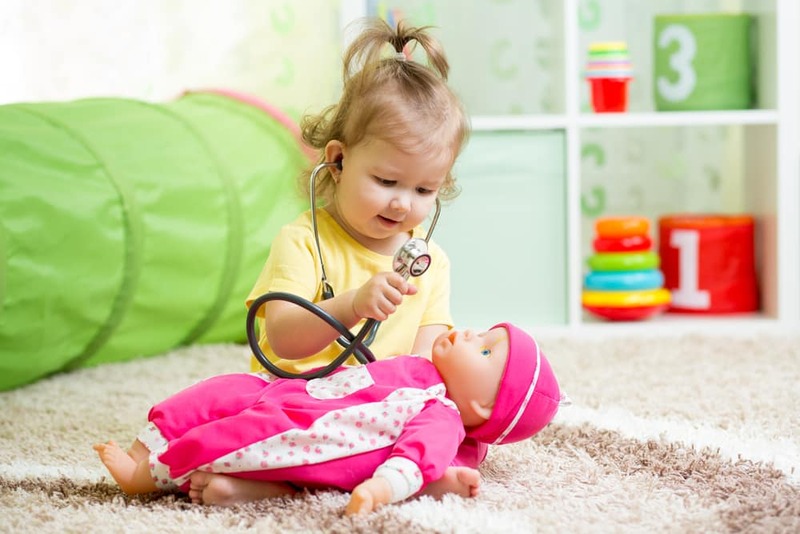 When they play “house” or play with their dolls, they are role-playing and exploring their feelings about parenting and family dynamics. A child may not know how to tell a grownup that she experienced abuse. But in drama therapy, she may be able to play act the whole thing with dolls. A child who experiences terror, and suffers from post traumatic stress disorder (PTSD), may need to let out pent up scary feelings in order to face them and move on. Telling her story in drama therapy, as if it happened to someone else, may feel safer than just talking about what happened. Sometimes children have a hard time making friends. They feel awkward talking to their peers and might not know how to break the ice. At other times, a child may be so afraid of rejection that she becomes a loner by default: she (let’s call her “Jane”) is too afraid that Miranda won’t want to jump rope with her, so Jane doesn’t bother to ask. She just sits in a corner by herself. In drama therapy, Jane can practice asking Miranda to jump rope and imagine the different responses Miranda might offer. She can practice having Miranda say yes, and she can role-play Miranda saying no. She can role-play her own part as well as role-playing Miranda’s part, too. Jane can play-act every possibility of this interaction and see how she feels in each case. In this way, Jane has a chance to see how she feels in the worst case scenario of rejection, and get used to how that feels. In drama therapy, the child is the star of his own drama. But there are still more possibilities. Jane can then go back and see why Miranda said no. Was it because of the way Jane phrased the request? Did her fear of rejection come through and color Miranda’s negative response? In exploring every facet of this pretend interaction, Jane might find a more effective way to behave in social situations. In so doing, she gains a measure of control over what looks like a hopeless situation in which she is helpless: Jane can learn how to make friends. Role playing is the most common tool used in drama therapy. Another common tool in drama therapy is mask making. When a child creates a mask, he is expressing emotion with paint and paper. Making a mask can be a relief for a child who has trouble talking about his feelings. Wearing a mask is like putting on a new mood or personality. A child who has been forbidden by his abuser to speak about the abuse, may find masks a safe way to show what happened and how he feels about that. 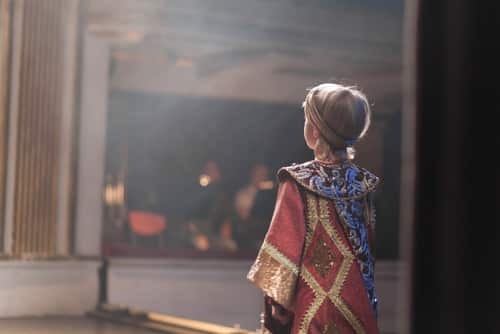 One reason drama therapy has become so popular in recent years is that it doesn’t have the same stigma as just plain therapy. A school child or teenager would be embarrassed for friends to know she’s seeing a “shrink.” But going to drama therapy doesn’t have that same kind of negative connotation. It sounds more like an extra-curricular activity, a fun thing to do, than a way of getting in touch with feelings or dealing with emotional problems. 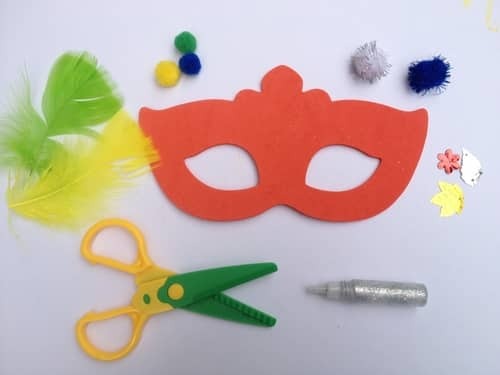 Mask making is a tool that is commonly used in drama therapy. In short, drama therapy offers a safe, fun, and effective way to explore issues. If you feel as though your child is getting nowhere in her therapy, you may want to look for a qualified drama therapist. The North American Drama Therapy Association (NADTA) website, has a search page for finding drama therapists in the United States and Canada. 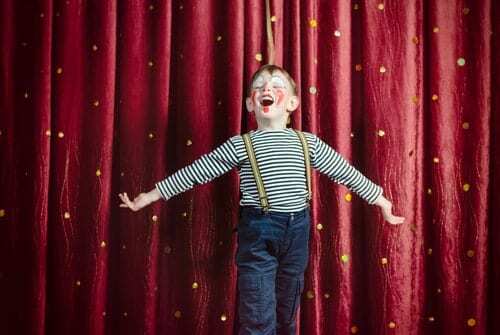 Has your child had a success with drama therapy? We’d like to know about it. Write to Varda at Kars4Kids dot org with your child’s success story. Is There a Right Way to Teach Kids About Death? Is there a right way to teach kids about death? Death is a touchy subject for most parents, right up there with the birds and the bees. You wish you didn’t have to explain it to your kids. For one thing, it’s awkward. But there’s no getting around it—death is a part of the life cycle, and it’s something that confronts all of us. It’s just one of those things: explaining death is a parental duty a parent cannot escape. A child’s first experience with death may be the sight of a baby bird fallen from the nest, or the death of a family pet. Sometimes however, a child’s earliest acquaintance with death comes when a family member dies. Now even on a regular day, when there’s no death on the horizon, it’s difficult to broach the subject. But death is an especially touchy subject to convey to children when the need to explain the import and finality comes during a time of painful personal loss, when the brain is befogged with heavy emotion. That’s why it is ideal for parents to teach kids about the lifecycle from the abundant examples in nature as opportunities present. Outings are great for generating clear examples of pregnancy, birth, aging, illness, death, and decay. By making the lesson an ongoing event, a child has a chance to leave the subject only to revisit it again and again in a natural way, so that the lesson is more fully absorbed, providing firm footing for later, more personal experiences of human loss. A child may see a pregnant pet or a mother dog with nursing puppies, or perhaps he will see a dead insect and wonder why it doesn’t fly away. The seasons and plants also serve well to explain the lifecycle to children. Plant a bulb with your child. Revisit the site and watch as first there is foliage and then a flower bud or buds. The flower blooms and then dies after which the foliage turns brown and shriveled. But the bulb with its potential for new life, remains underground, even when it cannot be seen. The lifecycles of the plant and animal kingdoms can coincide, as in spring. A trip to a farm or a zoo can help to illustrate this. Point out to your child that all around is new green plant life at the same time as so many baby birds and animals are born. Just as spring is a time of rebirth, autumn depicts a lifecycle about to end, with winter approaching as a time of hibernation. A homemade compost pile is a green way to teach children about the lifecycle too, relative to the breakdown of plant material. Composting illustrates to a child how even in decay, there is fertility and life, as vegetable matter becomes fertile soil that can nourish a garden. Find out all you can about the manner of death so you can respond to your child’s questions in a manner that is both truthful and factual. Keep your responses simple and clear cut. Don’t play down the event as something minor—it’s not. Be ready to accept your child’s response, whether he expresses a great deal of emotion or very little (both are perfectly normal). Give your child lots of ways to express and play out his feelings, stress, and tension: drawing, talking, strenuous physical activity such as a workout or swimming, singing, writing, or whatever suits your child most. Remain ready to listen to your child if he feels like talking about the death, either now or later—even much later. Listen to your child with your full attention. Never become fed up and decide it’s been “long enough” but give your child all the time he needs to feel, speak about, and come to terms with his experience of loss and grief. Author Varda EpsteinPosted on 04/27/2014 11/02/2017 Categories Education, GriefTags children, death, grandparents, grief2 Comments on Is There a Right Way to Teach Kids About Death?